Full day today – morning working on ad copy for Knitty, and then an afternoon reunion with the Dutchies. The Liong de Greeves are here on a long weekend, with their three little ones. Jasmin & Ben are now kids, no longer toddlers. Alana was tottering around on her own like an intrepid explorer, armed with her crackers and giggling away to herself. Time flies. We met up with Paul & Barb & Sophia, Kathryn Morris and Madelyn, Jenny & Andrew and little Oliver at Pizza Express on London Wall. The kids ended up running around on the high walk chasing Paul & Marc. It worked out perfectly. The highwalk is safe and perfect for kids to run amok, and the museum is just a couple minute walks from Pizza Express. The Museum of London was great – easy to get around, not too crowded and with a separate kids activity area. We all ended up there helping the kids make paper stained glass windows. I can’t believe I’ve never been (despite working within spitting distance for 2 years). The Roman exhibit was super cool, and the fire of London bit was also really fascinating. We got a book on the fire of London so hopefully that will be a good read. Went to the Apple store yesterday for my One to One appointment. After getting huffy with the staff for not being able to find my appointment, I pulled out my laptop to get my confirmation email. Which clearly stated that my appointment was for 1pm Thursday ….. the 4th March. Oops. Note to self: huffy and pie in the face doesn’t come off well. This morning a chap with two dogs asked me if I were Dora. You see, Dora walks her black pug around the harbour. She is, apparently, from Hong Kong. She goes to dinner parties with people from the area. How do I know this? Because I keep getting asked if I’m Dora. A few months back when I was walking Deuce a chap came up to me and asked me if my name were Dora. He told me that his friend told him to look out for Dora who walks her dog around the harbour, and he thought I was her since I also have a black pug, and Dora is Hong Kong Chinese. It was a bit odd, since I’ve met or know most of the dogs who are regulars around the area and have never seen another Chinese girl with a black pug. I bumped into him once more when he asked if I was Dora and when I said no he promised never to ask me if I was Dora again. True to his word, he hasn’t. But Dora has been busy it seems- a couple weeks later I met another guy who asked me if I was Dora – he we due to meet her at a dinner party but thought I might be her since, black pug, chinese, you know the drill. Off to walk Deuce and search for Dora. Maybe one day I’ll meet her! Or maybe she’s just a modern version Mr Snuffalufagus, visible to everyone except me! Had a plum today. I know I know, totally out of season (here, but not in Africa it seems). But there really are only so many apples, bananas and oranges I can eat. It was delicious. Jenny made us a plum tart that was absolutely gorgeous. 4oz butter, 4oz self raising flour, 4oz sugar, zest of lemon, a handful of plums and a scattering of sliced almonds. Yummmmy! Meanwhile Deuce has been marking our house. It’s been 3 times since the new year. Really annoying – the first time was when we moved the furniture all around and did a big clear up, the second and third time was just after Simon and Cath left. I did some reading and marking seems to be a issue of confidence – Cleone told me today that he always tries to pee on her curtains and in her car (she also walks other dogs so it makes sense that he’s trying to assert dominance over his territory) – and it’s going to be a toughie to change. CONSTANT VIGILANCE apparently is the answer. Or belly bands. Will keep a close eye on him and hopefully we can train him out of it. Chopping his little balls off may or may not help. I guess if it gets any worse we can consider letting him join the ranks of the castrati. Time for bed. No knitting today. Tomorrow! track, one goes head first. Pretty scary. The Tetris-on-crack look aside – this is supposed to represent London – historically, culturally, socially, and inspire youth to join the Olympics. I can’t say I’m that inspired by it, though I also can’t say I’m much of a youth anymore! Actually I am embarrassed that a city with so much going for it should create such a crappy logo. But the Games will of course be so much more than the corporate logo (I hope). While I think the political machinations of the Olympic Committee are wholly outside the spirit of the games and they ought to be heartily ashamed of themselves, the opportunities the Games afford young athletes from various countries outweigh and to a certain degree, are outside what those crafty old silver backs get up to. The Taiwanese ski team, the Jamaican bobsled team for example. The ability for people from wholly different political systems to get together for a common goal. So totally unexpected and yet so incredibly awesome that those guys can get out there, train and compete in an international event. Anyways, I am intrigued to see what kind of mascot London will have for the summer games. There have been some really great mascots, and some, ah, more ‘interesting’ examples. For your enjoyment, I’ve rounded up most of the mascots (except the Mexico games, I couldn’t find images for them): Crap none of my images came across. So check out the images here and quite a funny write up! Schuss. A skier. He was an unofficial mascot for the games, but since Schuss, every single game has had a mascot. Waldi’s a daschund, which apparently is a popular breed in Bavaria. Waldi epresented the attributes required for athletes – Resistance, Tenacity and Agility. Wiki says he represents the Games of Simplicity. No idea what that is. Beaver. Flying the flag. Pretty cool, and I think Sue Sylvester is awesome too, but not sure that is what they were aiming for. Wiki says: “Its face design resembles the hat and goggles used by competitors. Named for the Adirondack Mountain range.” I think he looks a little bit like a washing machine repairman but maybe it’s a skating outfit. Misha was hugely popular and the first major mascot in an Olympic Games – and of course the bear is the national symbol for Russia. frightening and blood-thirsty. A bit tangental to the games, but hey, marketing is marketing. Sam, 1984 LA: Designed by Robert Moore of the Walt Disney Company. Uncle Sam. Er, not much more to be said. Heidi & Howdy, 1988 Calgary: Western hospitality. Was pretty surreal to be met at the airport by 6 foot tall fuzzy bears in stetsons. Hodori, 1988 Seoul: We’re grrrrrrrrrrrreat! Apparently tigers feature large in Korean legends. Magique, 1992 Albertville: No comment. Cobi, 1992 Barcelona: From the country of Picasso and Miro, we have a cubist catalan sheepdog. How cool is that? Håkon and Kristin, 1994 Lillehammer: Two Norwegian kids. Getting real with the homies. I’m cool with that. Izzy, 1996 Atlanta: The dubious honour of being the first computer generated mascot, as described by Wiki. Syd, Olly & Millie, 2000 Sydney: Olly, a kookaburra for generosity, Syd (=Sydney duh) for the environment and energy of Australians, and Millie for the millenium. Copper, Powder & Coal, 2002 Salt Lake City: Each one is a representation of Higher, Faster & Stronger (Olympic motto: citius, altius, fortius). Athena & Phevros, 2004 Athens: Two children as ancient greek dolls. Neve & Gliz, 2006 Turin: Humanised ice cubes. Riiiiight. Miga, Quatch, Mukmuk, 2010 Vancouver: Miga is a mythical sea bear (part Orca and kermode bear), Quatchi a sasquatch and Mukmuk a Vancouver Island Marmot. outrageous hat wearing, cigar chewing, english bulldog as a mascot. Please let us do better than the ice cube twins. The Guardian has a selection of 12 mascots submitted by readers – I liked the unicorn and lion from the coat of arms, and Hope & Glory – very British! Haha and of course, I also quite enjoyed Dodgee the Olympic Hoodie. Saturday night was a double night out – first up was Alicja’s birthday party. Can’t believe she arrived here 3 years ago, a little bit lost and now pretty much has the town at her feet! Her party was at Anam, a bar up in Islington. I got there late, as was busy finishing up her birthday present! They’re cashmere fingerless gloves – the pattern is super light, but kind of neat looking. Like a pale wallpaper. I was afraid I wouldn’t have enough of the other pink I had, so I used the paler pink as I had 2 balls of it. Turns out I needn’t have worried – the pair took about 20grams of the contrast colour and 25 grams of the main colour. 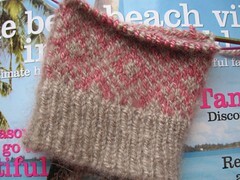 The pattern is Endpaper Mitts from Eunny Jang. Lovely knit and easily memorised. 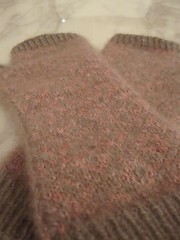 I liked them so much I’ve started myself another pair in the darker pink. I have 25 grams of it so will be fine. Yes that is Conde Nast’s beach issue. Given the dreary sky I needed some sun and surf to cheer me up, while working on cashmere. The second half of Saturday night was picking up David, Carl, Simon, Andrew and Cath under a bridge in the City. Literally. We were supposed to meet at a curry place in Smithfields, me joining them from Alicja’s party. Unfortunately the first rendez-vous point was closed, and the second place they tried was closed too. We were tag team racing a bit since I was in our car driving south and they were in a taxi trying to figure out where to go, but on the same street a few miles apart. They finally got out of the cab under Holborn Viaduct and a few minutes later I was pulled up and the four boys (two at 6 feet and two at 6’4”) and Cath piled into the car. Bit of a squeeze! We found a place on the Cut that was open and served curry! Yay. It was pretty funny – a lamb madras curry showed up but the waiter didn’t know what it was – so he just said ‘lamb curry’. Since a couple of us had ordered lamb curry, we asked – which one? He kept saying ‘lamb curry’. By deduction we figured out who belonged to it. The same waiter, at the end of the night when we were paying our bill, told us ‘I love money. It is sweet like honey’. Ooookay. Cath and Simon stayed the night, and we had a nice walk up the kings road then we made them lunch. Except it was served at 5pm. Anyways I made a chicken pot pie that was pretty yummy. David followed up with tarte tatin. Then we followed that up with gorgonzola and epoisses. I felt sick after all that, but boy was it worth it! Today is a lazy day – off to the park with Deuce, then to the gym. Saturday night was awesome. We had a full house of my favourite peeps (minus a few who couldn’t make it). 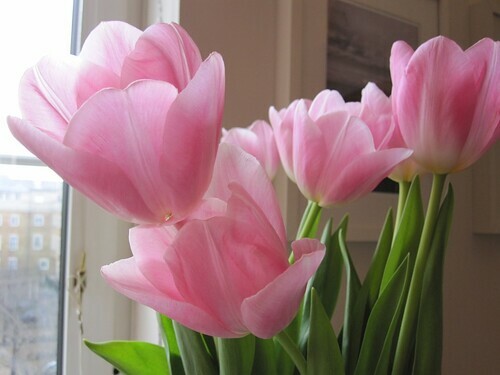 Sophia and Barb arrived first to help with dumplings, and brought the most beautiful bouquet of delicate pink tulips (chosen by Sophia for Valentine’s Day). I had a small team folding dumplings, and they did a stellar job. Sophia made gorgeous pleated dumplings. We had a ton of food which was so much fun to make. I made a few things for the first time – and they turned out pretty well. 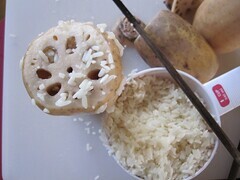 I did a veggie and meat version of my mom’s sticky rice (we always had our turkey stuffed with this rice. Soooo yummy). The meat version had a few uncooked rice kernels, but the veggie version didn’t. I think this was due to the veggie version sitting in the rice cooker and steaming for a further half hour after I cooked it. Will try that next time. 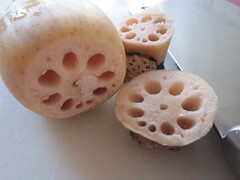 The other thing I made for the first time is lotus root stuffed with rice. These thingies are super cool. 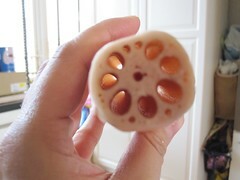 They are shaped like sausage links, and when you cut the ends off, you find these holes inside. The holes go right the way through to the other side! I was supposed to stuff each hole full of uncooked rice. Those holes aren’t so big, and well, it’s pretty fiddly. I managed two or three holes, and gave up. David did the rest on that section of root. Unfortunately we gave up and decided to just cook them plain. They were tasty but I have to admit the rice was a nice addition. Maybe next time we will persevere. Or we’ll just cook them plain so they are still a little crunchy. They are nice crunchy. 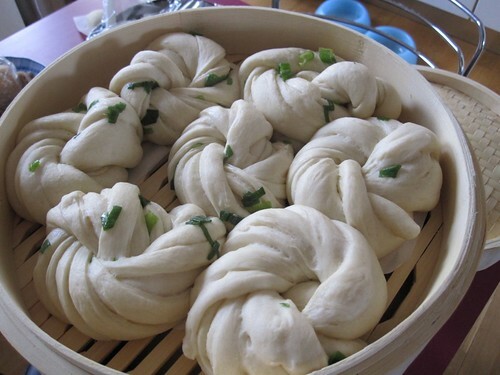 I also made more mantou and huajuan. The huajuan turned out really tasty and way better looking than last time. 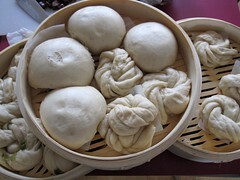 The bamboo steamers also helped hugely – no ugly condensation craters on the top layer. I ended up with dough that was too wet, so it took way longer to cook than normal (an hour as opposed to 15 minutes). The indentations on the mantou are from me poking them to see if they bounced back. The huajuan were way more popular than the mantou – given I eat mine with peanut butter I can understand they aren’t so great plain. We also got a peking duck. Surprisingly not that much drinking. Maybe not surprising those without kids drove, and those with kids, well, had kids! We passed around some sake, and some riesling. Ellen, Lawrence & Claire from NYC also came as they were in town for the week, Dan who I haven’t seen for over a year too which was really nice. Was really nice seeing everyone mingling – and one thing everyone in the room shared was a huge love for food. There was a lot of chinese pop on the Sonos, and then a bit of China themed songs (China Doll by Bowie, China in your hands by T’pau…). I managed to leave off the niangao stir fry and the seabass. Ran out of time! Good thing though as we had way too much food. Sunday we were up for dim sum at Joy King Lau in Chinatown. They had some great dim sum – the best being their homemade sweet niangao! Only one dish didn’t make the grade – the custard tart. A little too yellow and big and not very flaky or light. Still, the rest was quite yummy. Met up with Ellen’s incredible circle of friends and literally stuffed ourselves for a tenner each! Gotta love chinatown prices. Went to see A Single Man that evening – beautiful but depressing. I’m not sure we’ve moved on that much since the 50s. It certainly is more acceptable to be openly gay, but sadly what the movie depicts still exists, particularly in more conservative spheres. Colin Firth’s character George is dealing with the loss of his partner Jim (played by Matthew Goode). Despite the fact that George & Jim were together for 16 years and from the many flashbacks, were in a stable and loving relationship, when Jim dies a cousin calls George in secret because the parents don’t want George involved at all (or it seems to even know about Jim’s death). George is told in not so many words not to come to the funeral since it is ‘for family only’. George’s best friend tells him, in an unguarded moment, that George & Jim’s relationship wasn’t ‘real’, and that he ought to marry a woman to have a ‘real’ relationship. She doesn’t really mean it the way it comes out, but it resonates with how some people view gay relationships. It’s so incredibly sad. That one person’s love is somehow not as legitimate as another person’s. Or one person’s grief is less real than another’s. We still have some way to go.